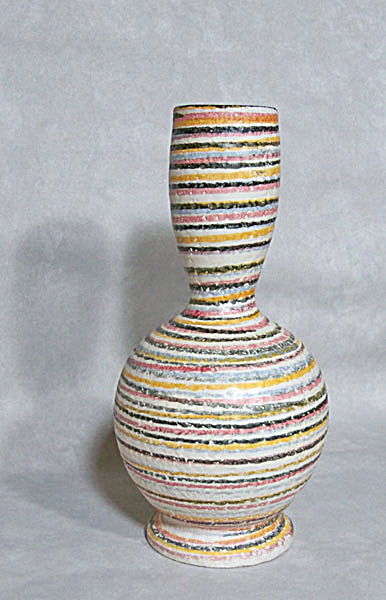 This 9 inch tall bottle vase is very appealing and would work with many different color schemes as an accent piece. The main glaze is white onto which horizontal bands of red, black, purple, orange are painted. The inside of the vase is glazed in a deep luxurious cobalt blue glaze. The vase is stamped 8600 C and Handmade in Italy on the bottom. The body is of red clay as were many of the Bagni or Londi Bitossi pieces. 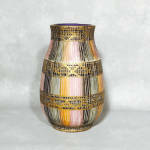 This vase has a great retro mid century look to it. Add it to your Midcentury decor today. It is in excellent condition with no chips, cracks or damage.